If you're an adult looking to learn or improve second language skills in order to better communicate with friends, family, neighbors, and those around you, we have a class for you. Private classes are available in our downtown Santa Rosa Learning Studio, featured above, or at our downtown Petaluma location. Meet one on one with your instructor for a completely customized language learning experience. Before your first session, your instructor will shape the class to your needs based on your level of language acquisition, your schedule, and your motivation for learning the language. Your curriculum will be designed around you, your outside class work arranged to your preferences and abilities, and you'll maximize your results in a class that moves at your pace. Most importantly, you'll gain real communication skills from day one that you can put to use right away in conversation! Take a class with a friend at our downtown Santa Rosa Learning Studio. Similar to a private class, a semi-private class is a private class experience that is shared with one or more of your colleagues. If you and a friend or co-worker would like to sign up for a semi-private class together, your instructor will modify class curriculum to fit each of your needs. This class setting works best for those with similar language levels and learning goals, but your instructor will help you make this determination during your free consultation before your first session begins. Group classes create community as well as amazing results! Leave your textbooks and former language learning experiences behind! Small group classes are a great way to grow your communication skills in a second language within a community of like-minded individuals. From your very first day, you will get to spend the majority of class time immersed in the target language in an entirely comprehensible format. In other words, you will understand everything! 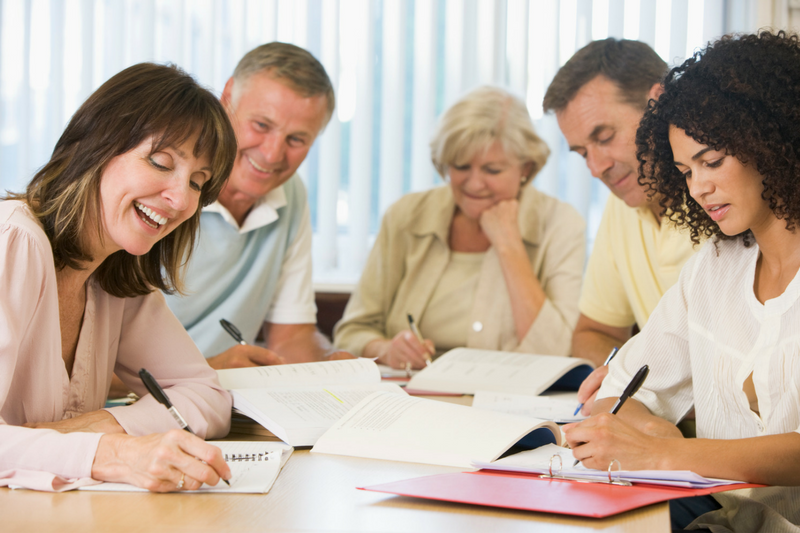 Our group classes will engage you in a personally meaningful way in all essential aspects of the language: listening, speaking, reading, and writing. We use a second-language teaching method known as TPRS® (Teaching Proficiency through Reading and Storytelling), which uses highly-interactive stories to provide comprehensible input and create immersion in the classroom. It is a low-stress, fun environment that produces amazing results at every level! May vary by length of class session or total class hours per session. Sessions are typically 6-8 weeks. See current and upcoming class offerings on our Featured Classes page. Sign up for our bi-monthly Newsletter and be the first to find out about new classes and get special offers!